To wrap up an amazing year at Pass the Sushi I have one more killer giveaway for you. There are some big changes in store for the blog next year, some large goals for 2013, and a lot more sass and fun. But that’s for a future post. 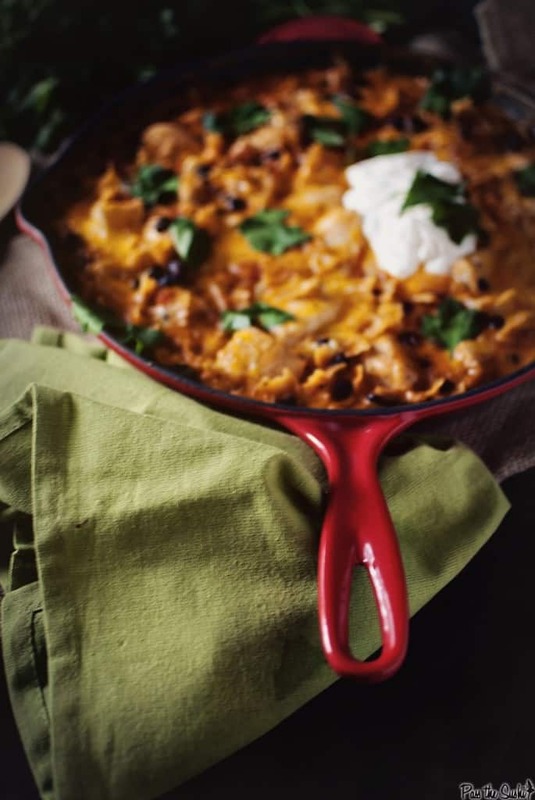 For today, in this crazy busy week, I have a simple weeknight meal for you and a chance to win this gorgeous skillet. Since receiving my Le Creuset skillet, I think all of my other skillets have grown jealous and accumulated a thin layer of dust. I find myself keeping this bad boy ready for go time on the counter and using it for everything from cooking bacon to this weeknight dinner. I can’t rave enough about how sturdy it feels and how nice it is to cook with. It takes my hand-my-down stove and really classes the joint up. 😉 Between the skillet, some holiday gifts from past and present, and Doris my kitchen is starting to look pretty rad! On a side note…. I’m freaking out a little right now because I can’t find my sacred notebook where I write all my recipes in. If and when I find it, I will update this recipe for anything I may have left out. OK, found the notebook. Whew. 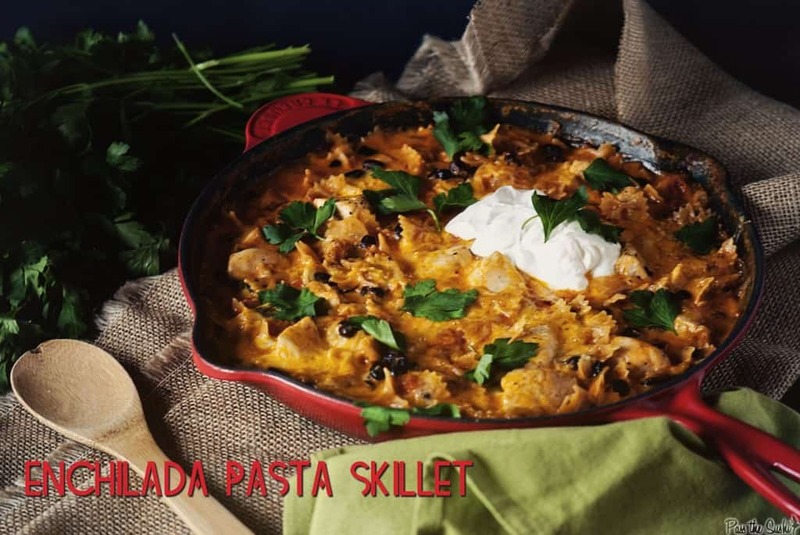 Ever since seeing Julie’s Enchilada Pasta Casserole, I have been dying to try out the flavor combo of pasta and creamy enchilada. I needed a quick dinner to get us through before the barrage of Christmas leftovers took over my fridge and this was the perfect solution. I gathered my normal enchilada fixins and got to work. Adjust the heat for your family’s taste. Heat 1 tbs olive oil in a large skillet over medium heat. Season chicken with salt and pepper and place in skillet. Brown on all sides, about 5-7 minutes. Transfer chicken to a plate, cover, and set aside. Wipe out the skillet and heat the remaining olive oil over medium heat. Cook the onions and peppers until soft, stirring frequently, about 5 minutes. Add the beans, enchilada sauce, chicken broth, Tabasco, Velveeta and pasta. Cover and adjust heat as needed to maintain a low simmer. Cook until pasta is al dente, stirring to prevent anything from sticking to the bottom. (My bow ties took about 10 minutes). Reduce heat to medium low and add chicken, and any accumulated juices back to the skillet. Cook until everything is heated through and sauce has thickened, 3 to 5 minutes longer. If desired, sprinkle with remaining cheese, and place under broiler for a few minutes until cheese has melted. Top with scallions, cilantro, and a large dollop of sour cream, or serve in small containers on the table for everyone to scoop their own toppings. To enter to win your own shiny large cherry Le Creuset Skillet – head over to the Le Creuset site and let me know what product you would use the most in your kitchen. And as always, bribery and flattery goes a long way in the PtS kitchen. Entrees accepted through midnight Thursday January 3rd 2013. Winner will be announced on January 7th’s post. Winner must live in the United States. Now the pasta…..wow….major comfort food. I love Cheddar, but yeah, Velveeta is my thing too. It looks delicious. Hope you had an awesome Christmas. What a great giveaway. Thank you so much for this opportunity. I think I would use a skillet to cook everything from steaks and bacon to some nice fluffy eggs and pancakes. A cast iron skillet is all I need to cook everything and to have a complete kitchen ;). Honestly, I would most love the skillet you are giving away! But that pumpkin casserole dish is mighty cute! “Like” Le Creuset on Facebook! Following Le Creuset on Twitter. I love Le Creuset. I only have a french oven and would love to have the skillet. I follow you on face book, I pinned this post and I follow Le Creuset on facebook. Fingers crossed! Have enjoyed following your blog and on Facebook for over a year now I think. This recipe looks fantastic. I like to make my own enchilada sauce from a recipe from Cooking Light magazine. It’s easy and so tasty. The combo of pasta and cheese is always good in my book, add in the Mexican flavors and the chicken and you’ve got a winner as far as I’m concerned! Now regarding the LeCruset. I got a small oval baker and a gorgeous 5 quart covered casserole for Christmas. I am thrilled with them both. The truth of the matter is that some people like expensive shoes, and some people like fast cars, and some people like pretty handbags. When it comes to me, you can keep all of that. I am all about the pots, pans and knives. Frankly, if you are giving away ANYTHING LeCruset I would take it and love it and make it my friend. 🙂 Happy Holidays! I would love the HERITAGE 9 1/2 QT. DOUFEU. Following Pass the Sushi on Facebook! I would use one of the larger stock pots the most for boiling lobsters and making stews! I’m following pass the sushi on facebook. I’m following Le Creuset on facebook. I would love to try their oval skillet. I have had such a hard time finding a skillet I loved, so maybe this would be it! I’ve repinned this post on Pinterest. I would use THIS!!! I’m dying for an amazing cast iron skillet like that. OMG. I would use it ALL THE TIME. I follow Le Creuset on facebook. I follow Le Creuset on twitter. This dish positively has my husband’s name all over it. Actually, I think he’d be happy if I won that bunch of cilantro in your pic! He’s a cilantro lover, and I’ve not been making anything “cilantroish” of late. I’ve got this one printed and on the top of my recipe pile for when he gets home! Fantastic recipe. I’m a follower of you on Twitter…. Ok… now for the bribery… If I ever win the lotto, I till totally share it with you!! 🙂 And as always, your photos are so beautiful. One of the commenters on G+ has already said we should have forks included so we can taste right away. I love you on FB… Like doesn’t cover it! I follow you on Twitter. I’ve also staked out a bird feeder for your tweety! I pinned your recipe! Better than that, I’ve printed it out and plan to actually create it myself. I love anything with the words Enchilada and Cheese in it!!! Bribery… I have nothing but to say that I wish you a VERY happy new year… One filled with continued success, perfect health and all the love you deserve! The skillet! Happy new year! After reading this recipe, I am going to pin it and make it this week. I think I definitely need the le creuset skillet!!! My husband loves bacon and I cook a lot! Love your website and recipes. Thanks! I made Julie’s version for my craft group a few weeks ago and it was a major hit – I have no doubt your version will do the same! I can see myself using both this skillet and the 5 1/2 qt round french oven every day! Thank you for the chance!!! Can’t wait to make this casserole. Looks like something my boys will devour. Been following you forever on Twitter. my stepdad and i have had many discussions about le creuset skillets, and in particular how much we like the ‘nutmeg’ colour! he’s already got a crockpot and i don’t, so i maybe covet that most, but we’re certainly interested in acquiring a shiny new skillet too! 4 1/4 c souppot is beautiful! I would like the cast iron deep covered skillet! Oops – forgot the important post! I have tons of uses for the 8-qt stockpot from Le Creuset, would love to have one in my kitchen!! I’d probably use the 12″ nonstick deep fry pan the most. I like you on Facebook. Happy New Year! I would love the Le Creuset Skillet- I don’t have a skillet that goes from the stovetop to the oven. I would use a 5.5 quart dutch oven! I would use the skillet! This would be the perfect excuse to thow out the old one. Kita, this go my attention because it looks so yummy! 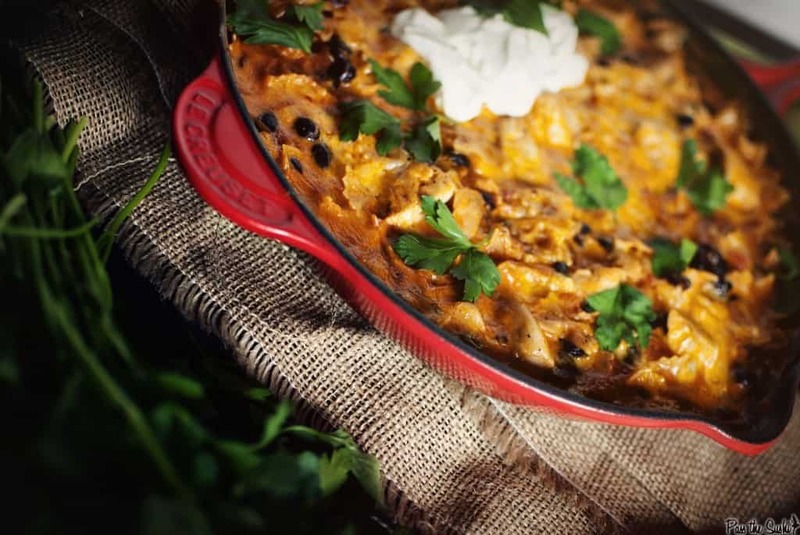 I love easy Mexican dishes and in this pretty skillet is even better. I would use the skillet yo have the most. I of course follow you on twitter! I did everything on twitter, fb and pinterest! the 7 qt. dutch oven would be awesome! 3 3/4 QT. DEEP COVERED SKILLET is what would love to win. I pinned your recipe, liked you on FB, and tweeted your contest. I so need this pan – it was on my list this year! definitely the 5 1/2 qt french oven, love the color cassis! I would love that grill/griddle! I started following Le Creuset on Twitter and pinned this. I’ve done most all the other things for your previous giveaway. I love all Le Creuset cookware, but that oval French oven is calling my name! Would so love to win. I love all of their products, but one that caught my eye was the 3-tier stand. That is definitely something that I would use a lot. I’m pretty sure I Google +ed it (but then again I am still learning everything about it). For the give away, I would definitely use 11 3/4″ Iron Handle Skillet religiously! I would love the 10 quart stock pot. I am an email subscriber. The product I’d use the most is the Heritage 4 qt. Rectangular Casserole. I follow Pass the Sushi on Facebook (FB name: Madeline Brubaker). I follow Le Creuset on Facebook (FB name: Madeline Brubaker). I follow Le Creuset on Twitter (@shala_darkstone). I follow the e-mail side.I love the site,and cook,for a family all the time.I do use the skillet most of the time!! Have a wonderful New Year!! I don’t own any Le Creuset, but I would use the skillet or soup pot most! 2 QT. ROUND FRENCH OVEN is the piece that I would use alot. You are also on my Facebook page…………Have been reading your blog for quiet a while.Would LOVE the new pan!! I’d love to own the 5 1/2 qt. Round French Oven in Caribbean. Would love that shiny large cherry skillet but if I had to choose one thing (there’s too many to choose from) it would be the cassis mug. It’s beautiful and I’m a big tea and lemonade drinker plus I love to put soups, chilis and stews in mugs. I am subscribed to you by email. I repinned this post on pinterest. This looks so delicious! Will be using GF pasta, but should work fine! I have been looking at the Le Creuset Skillet and cast iron grill pans. I live in a small apartment where I cannot have a grill so a grill pan is a MUST!! Did all of the possible– flattery at its best! I like L Creuset on FB. I would love the 6 3/4 qt. Oval French Oven in either Aubergine or Ocean ~ absolutely gorgeous!! Pinned the post at Lisa E.
After the skillet, I would definitely use a 4 QT covered oval casserole dish the most!! I covet the Le Creuset!! Thank you! 5 qt french oven for sure ! I love the cherry skillet. I love the 5 3/4 QT. COVERED OVAL CASSEROLE… and I love love love their colors! I’d use the 3 1/2 qt. chef pan the most. I follow Le Creuset on Twitter (@kawaiidragon88). Would totally use the French Oven most, but would really secretly want the Tagine. Difficult to store, but a chicken tagine is so wonderful. Entered, followed, pinned, tweet, google+, and all of the above. 3 1/2 qt French oven is the perfect size for a small family. Also subscribed to RSS feed. i love the cherry skillet! so gorgeous! love the skillet – have followed you and added you to my rss for awhile now, much admiration! Following le creuset on FB! Kita, this is one delicious looking skillet. It’s going on my weeknight dinner menu; thanks! Hmm, I really want one of Le Creuset’s risotto pots. I’m new to your site and I’m glad I found it. I look forward to trying out some of your recipes, they look delicious! Happy New Year! The 5 qt. braiser would get the most use in my kitchen. I love to stew and braise a lot! Sorry this is suppose to be an entry for following your RSS Feed via Google Reader. The 5 quart braiser in marseilles is at the top of my wish list. I am subscribed to your RSS feed in google reader. Google +ing this post. Your recipe photos are beautiful. I’m trying out the delicious smothered porkshops with smashed potatoes! Subscribing to my RSS Feed – done for a bit now! Google +ing this post – done! Pinning this post – done! I love all things Le Creuset – but one of their frying pans would just be epic. Iam signing up to follow you!!! 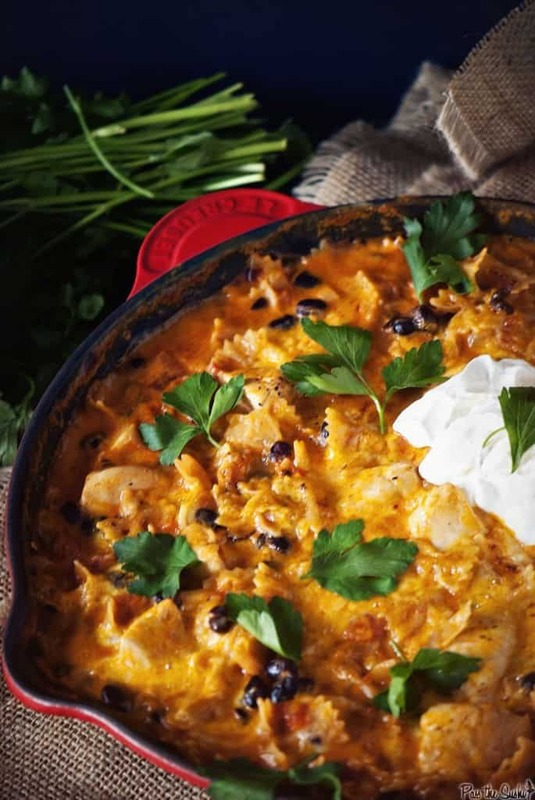 This recipe looks amazzing and I love anything Le Creuset!!! A skillet would be my most used item!!! I liked you on fb; liked le crueset on fb and Pinned it…..the braiser in whatever color you would want to “pass” my way!